COSTA MESA, Calif. — Today was a perfect Southern California day for students at Prince of Peace Christian School: warm, sunny, with a 100% chance of learning. Students from pre-school to sixth grade observed and tended their seedling crop. The young plants are three to four inches high and ready to be harvested and transplanted to a field where food is farmed specifically for the benefit of local families in need. The seedling project is one of several projects planned with the Second Harvest Food Bank of Orange County. This project began weeks ago when students prepared the soil and carefully planted cucumber, watermelon and zucchini squash seeds into a special garden on the Costa Mesa campus, located in the Mesa Verde Community. The Second Harvest Food Bank of Orange County distributes more than 13 million pounds of food to nearly 390 local charitable agencies each year including 36 soup kitchens, 128 food pantries; and 25 emergency shelters. A member of America’s Second Harvest — the Nation’s Food Bank Network, Second Harvest provides emergency food assistance to nearly 74,000 children and 20,000 seniors in Orange County’s 34 cities. 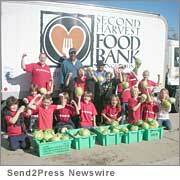 The Second Harvest Food Bank of Orange County is located at 8014 Marine Way, Irvine, CA 92618. The website address is http://www.feedoc.org.